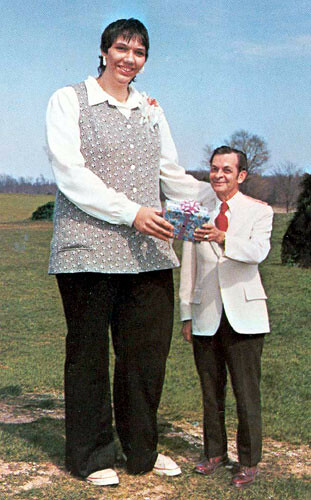 At 7' 7¼" (232cm) Sandy was the worlds tallest woman according to the Guiness World Book of records. Today August 13th, 2008, at the age of 53, in Shelbyville, Indiana sadly she has passed on, I'm sure to a greater destiny. I just saw Sandy on a television show not too long ago. She seemed like a great person, talking to children about the challenges of being tall, and working it in to how it can effect their lives and it is ok to be different. At age 10, she stood 6'3 and by age 16 she was 7'1. At 22, she had surgery to help stop the effects of giantism she was suffering. She has appeared in several movies that can be viewed on her IMDB page, and even wrote a book appropiately titled "Cast a Giant Shadow". She lived not to far from my home town.